A former Governor of the old Kaduna State, Alhaji Balarabe Musa, has said the Ekiti State Governor, Mr. Ayodele Fayose, is qualified to contest the 2019 presidential election. Also, the Alaafin of Oyo, Oba Lamidi Adeyemi, has praised Fayose’s courage in putting the Federal Government on its toes. According to a statement by the governor’s Chief Press Secretary, Mr. Idowu Adelusi, on Sunday, Musa spoke on the sidelines of the wedding of the daughter of a former Ondo State governor, Dr. Olusegun Mimiko, in Ondo, while Oba Adeyemi spoke in Ado-Ekiti during the fifth convocation of the Afe Babalola University, Ado-Ekiti. Musa said, “It is the right of every Nigerian to aspire to the office of the President of Nigeria. Anybody from any section of the country, who has met the constitutional requirements can vie for the presidency. There should be no restriction because the country is in need of a right leader. “Whoever that will emerge will be president of Nigeria, not the president of a section. 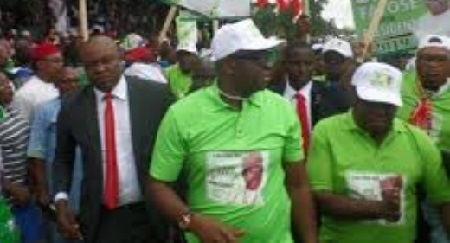 Fayose is exercising his right; it is wrong for anybody to vilify him for declaring his ambition. The man is bold, courageous and has put the Buhari government on its toes. Anybody having interest should come out so that we can compare,” he said. On the clamour for restructuring, Musa noted that the agitation had heightened because of insecurity, poverty, hunger and inequality in the county.